Kesserack Khemnu in "How I Learned What I Learned," through April 14 at the Arden Theatre Company. 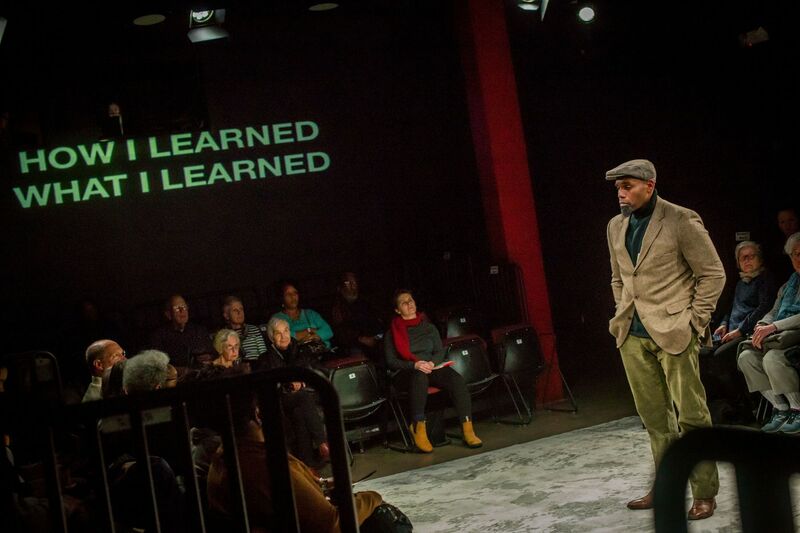 You don’t get everything you expect in August Wilson’s How I Learned What I Learned, through April 14 at the Arden Theatre Company. But take it on its own terms, and you actually get more. The Arden is moving through the entire Century Cycle, Wilson’s 10-play, decade-by-decade panorama of African American life in the 20th century. With Gem of the Ocean, they’ve done four of the 10. Running concurrently at the Arden are (through March 31), Gem of the Ocean, the second-to-last written (2003) though earliest-situated (1900-10) of the century plays; and How I Learned, as different as could be, a one-man monologue (co-conceived with Todd Kreidler) in which Wilson goes back to his formative years in the Hill District of Pittsburgh. My advice? See both, and see Gem first. After Wilson’s characters talk to you in Gem, let him talk to you himself. Kesserack Khemnu inhabits Wilson: He looks like him, walks and talks like him, and, much like a Wilson character, strikes up an easy bonhomie with the audience, as he tells where and how he picked up the skills. What you will not get is an artistic bio. Wilson zig-zags in time and focus, but, again like his characters, he layers the tales into a rich picture. We meet Chawley Williams, poet and junkie; Cy Morocco, “an African man lost in America”; Fred Rogers of Mr. Rogers’ Neighborhood, letting Wilson know, for the first time in life, that he is “always welcome”; Snookie, an early amour who’s nothing but trouble; Wilson’s mother, Daisy Wilson (who teaches him that SOMETHING IS NOT ALWAYS BETTER THAN NOTHING, in other words, never settle); and his first real love, Catherine Moran (in a sweet, funny story about his abortive role in a Catholic school Christmas pageant). Lessons? Plenty, some – SHUT MOUTH – posted in big letters in Matt Webb’s atmospheric lighting design. Other lessons are shown rather than told. Wilson, hungry and self-taught, ransacks the Carnegie free library, reading all he can get his hands on. Another lesson comes from Cy, who publicizes a big concert of himself on sax, but when he gets on stage, fails spectacularly. “Don’t force your soul through a horn you don’t know how to play,” Wilson realizes, and he works harder to learn language and writing. All is told in the American voice, Wilson’s. See Gem of the Ocean, see How I Learned What I Learned … and then welcome to the rest of August Wilson’s century. Through April 14 at the Bob and Selma Horan Studio Theatre, Hamilton Family Arts Center, Arden Theatre Company, 62 N. Second St. Tickets: $18-$52. Information: 215-922-1122, ardentheatre.org.